The results of the 2017 Ursa Major Awards were presented at an awards ceremony at FurDU 2018 in Surfer’s Paradise, Queensland on Saturday May 5 at 6 PM AEST [UTC+10]. Winners were selected by the public from nominations made earlier in the year. Each voter could choose three items in each category, providing three, two and one votes. Housepets! Are Gonna Sniff Everybody is the fourth annual collection of Rick Griffin’s award-winning (Ursa Major Awards, Best Anthropomorphic Comic Strip, 2009 to 2012) Internet full-color comic strip, following Housepets! Are Naked All the Time, Housepets! Hope They Don’t Get Eaten, and Housepets! Can Be Real Ladykillers. Book 4 collects the strips from June 6, 2011 to June 4, 2012. These are the story-arcs #43, “The Great Water Balloon War” to #55, “The Trial in Heaven”, plus all the one-off gag strips between those. Book 4 is back to lacking a real title page. Boo, hiss! North Charleston, SC, CreateSpace, August 2013, trade paperback $13.95 (53 pages). Hooray! Rick Griffin leads off this third annual collection of his Ursa Major Award-winning Housepets! comic strip with a real title page. A snarky title page, but nevertheless a title page. 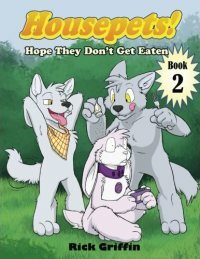 For those who are not already reading Housepets!, the Monday-Wednesday-Friday-updating Internet full-color strip (and why not? It won Best Anthropomorphic Comic Strip for three years running, 2009 to 2011, and it’s free), Book 3 collects the strips from May 31, 2010 to June 3, 2011. These are the story-arcs #31, “Spot McCloud Presents Comics” to #42, “Not All Dogs”, plus all the one-off gag strips between. North Charleston, SC, CreateSpace, August 2012, trade paperback $13.95 (56 pages; non-US purchase available). The winners of the 2011 Ursa Major Awards for the best anthropomorphic literature, artwork and websites published in 2011 were announced June 2 at a ceremony during Califur VIII. 1,782 ballots were cast in this year's voting, an increase of almost 30% on last year. Only the winners were announced at the ceremony. However, due to a policy change voted upon by the ALAA Committee, the vote order of all nominees is available on the UMA website. Read on for results. The story includes contributions from Fred Patten. 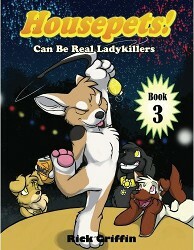 This book collects the second year of Griffin’s award-winning Monday-Wednesday-Friday full-color online comic strip, Housepets!, from June 1, 2009 to May 28, 2010. Wow! When Book 1 containing the first year’s worth was published in July, I assumed that Griffin would be publishing these annual collections annually. Nope! And I’m glad to be wrong. This means that we won’t have to wait another year to get the third year’s worth. Griffin (b. 1986; not the underground artist of 1960s-1970s comix and psychedelic posters who died in 1991) says he and his brother have been cartooning since their childhood; he got the rough idea for Housepets! in 2006, posted his first test strips on Fur Affinity during 2007, and the strip went online June 2, 2008. This collection is unretouched, so the reader can see its evolution from a simple black-&-white, two character strip to a complex full-color strip with over a dozen characters, and the maturing of Griffin’s art style during its first year.